As a small company owner or solopreneur, going it alone can be a long and lonely journey. That’s why it makes perfect sense for competitors to collaborate. Besides you, who knows more about the sort of business issues and concerns you face every day than your industry peers? They’re dealing with the same market forces, customer service issues, and business development challenges you are. It sounds crazy, but “collaba-tition” can actually work . My group – AKA The Gang of Six – is a shining example of how successfully competitors can collaborate. We function as one another’s board of advisors, confidants, and cheerleading squad. We agree that we wouldn’t be where we are today without one another’s support, honest feedback, and friendship. Our Go6 group formed after we’d met at conferences and workshops over the years. That gave us the opportunity to gauge one another’s competence, integrity, and have a comfort level with one another. Takeaway: Get to know one another before forming an alliance. You have to trust your inner circle to work together effectively. Geography matters. If you’re not in one another’s back yard, it’s less likely that you’ll be competing for the same clients. It does happen in our group from time to time. It’s not a big deal. Takeaway: Sometimes you win one, sometimes your colleague will. It evens out. Have complementary as well as similar skills or products. Your businesses may provide the same services but have differently specialties. Takeaway: Stay lean and mean and build the team you need for a project from within your peer group. Go6 engaged a strategic business consultant for a week of intensive training and strategy sessions, which radically changed how we did business. Takeaway: Share the cost of business development. Splitting expenses opens up opportunities that could otherwise be cost prohibitive. Have a common goal and set of objectives. You can’t know you’ve arrived unless you know where you’re headed. Take-away: Everyone needs to be pulling together, and everyone needs to pull their weight. In the words of a famous philosopher, we get by with a little help from our friends. Sometimes you’ll find those friends in strange places. 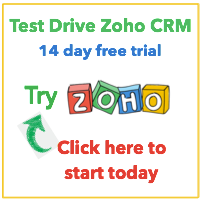 Expense Reporting – Zoho Expense is here!